Summer is here! In the UK our Summer is usually a 3 – 4 day spell of great weather surrounded by weeks of misery and disappointment! So if you are looking to add a little glow to your life don’t come to the UK, instead take a look at the new issue of 2DArtist. This month’s cover is another cracker by our Pin-Up tutorial series artist Serge Birault. Serge set himself a high standard in chapter one of his fantastic series, but hasn’t failed to continue to impress in chapter two. 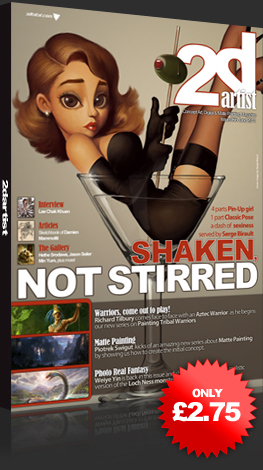 In this issue Serge looks back at some of the outstanding classic Pin-Up artists and how they gave their painting a retro look, and tells us how to reproduce that look in our own digital art. This month’s issue contains the final chapter of our Realistic Fantasy series. In this issue we welcome back Weiye yin. Weiye does another fantastic job for us and gives us a master class on how to turn something we are familiar with into a new and original concept. In this issue Weiye will be focussing on the Scottish legend; The Loch Ness Monster! The new season see’s the introduction of two new tutorial series, the first of which is a great Matte Painting series by Piotrek Swigut. Piotrek will be talking us through how he created his stunning scene in great detail giving us some really useful tips on the way. Piotrek currently works in the Movie Industry and spent a large part of his career working at Blizzard in California, so he is the ideal man to be teaching us some tricks of the trade. In this issue we will be looking at how to create the concept for your scene. The second of our two new series is Painting Tribal Warriors. Ancient tribal warriors have been the inspiration for many modern day character designs in both the Fantasy and Sci-Fi field. In this series our artists will be looking at how to use the information available to them to create an original and dynamic painting of a tribal warrior. In this issue Richard Tilbury will be talking us through how he gathered information and used it to create his illustration of an Aztec tribal warrior. Our interview this month is with an artist who I am a really big fan of. Lee Chak Khuen or Pupeteer Lee is an amazing artist from Malaysia. In this interview he tells us how his love for Music and Motorbikes inspires him to paint. You will love his images! He mixes the Manga design style with a loose concept art way of painting that looks great. This month’s making of is by the ever present Serge Birault. Serge leaves his cartoony Pin-Up style behind to show us how he paints his hyper realistic characters. My Little Lemmy is an amazing example of what Serge is capable of. I am quickly running out of space so I will just remind you to check out the amazing Sketchbook article by Damien Mammoliti and the breathtaking gallery featuring great artists such as Daniel Dociu, Min Yum, Jan Ditlev and many more.